American Express is producing a book with portraits and feature articles about some of their charter members. I was asked to do a portrait of Ralph Branca. 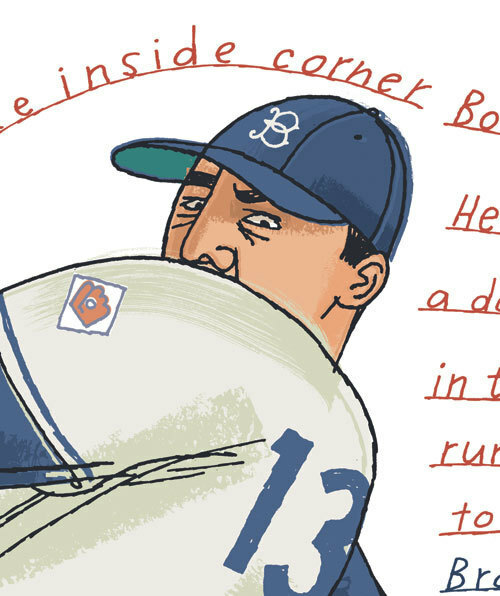 He’s the Brooklyn Dodger pitcher who delivered the pitch to Bobby Thomson that became known as “The Shot Heard ‘Round The World” in a playoff for the pennant in 1951. 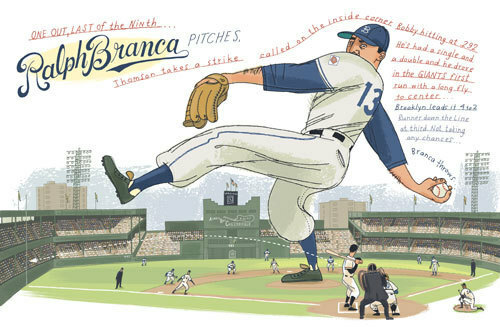 I drew the fatal moment Branca delivered the pitch. 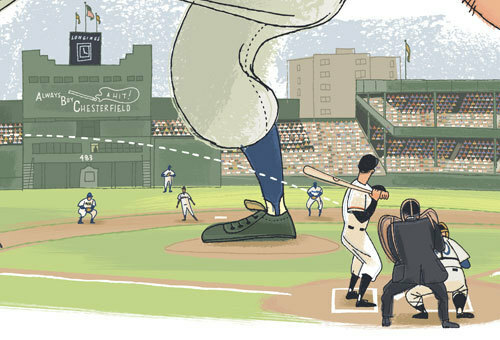 The game, played at The Polo Grounds has taken on legendary status in baseball history, and fans have been talking about it ever since. Should Branca have walked Thomson with first base open and pitched to the rookie Willie Mays? Did Giant coach Herman Franks steal pitching signs with a telescope from the centerfield clubhouse and relay them to Thomson? Russ Hodges famous play-by-play call was recorded off the television by a fan at home. What happened to the ball? 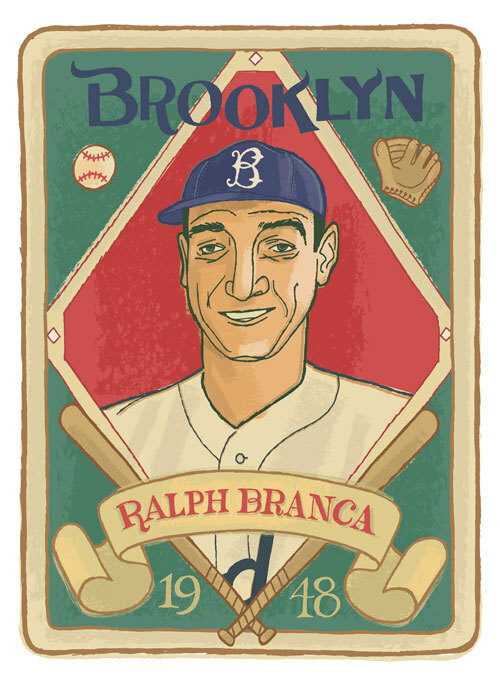 I also illustrated an imaginary baseball card of Branca from 1948, the year he was an All-Star. After Branca retired from baseball he worked in the insurance industry and was instrumental in the formation of the Baseball Assistance Team, a foundation that offers help to former major-league players who have fallen on hard times. 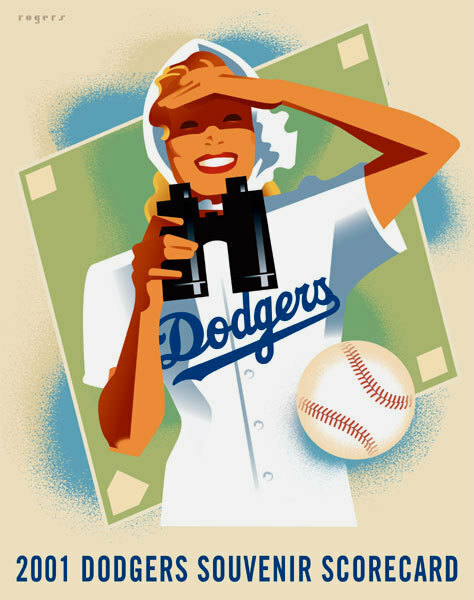 During the years 1997-2001 my friend Dan Simon was in charge of much of the design for mechandise and promotions for the Los Angeles Dodgers. We worked on a number of projects together and I enjoyed every minute of every one. I grew up in Los Angeles, and have been a Dodger fan my whole life, even when they fielded horrible teams. 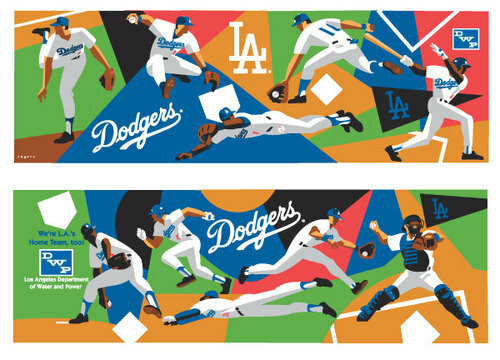 Dan is a great art director who knows the value of good illustration and it was great to see these projects appear at Dodger Stadium. One of the ideas Dan had was to print up old-fashioned scorecards like they used to sell in the past. Just a simple four-page scorecard with a cover design and an ad on the back. 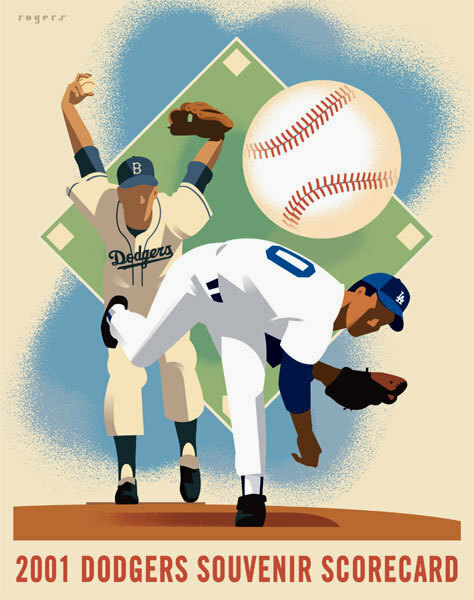 I have a collection of the scorecards Otis Shepard did for the Chicago Cubs in the 40's and 50s, and Dan didn't have to ask me twice if I thought I could do some new designs in that style. These two covers are shameless imitations of Shepard's wonderful work. (He also created hundreds of ads for Wrigley's Gum.) The second one is an even more shameless imitation of the legendary Joseph Binder, the poster artist that Shepard leaned heavily on for his own work. This was a short-lived idea however. These scorecards didn't sell well, maybe because no one knows how to keep score themselves anymore. 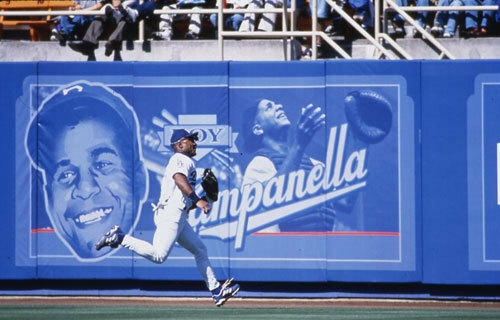 One year the Dodgers decided to line the outfield wall with portraits of Dodger greats from the past. Dan thought it would be a good idea to treat each player's portrait as a vintage advertisement. There were about 12-15 billboards that remained up all season. I enjoyed watching every game that year. 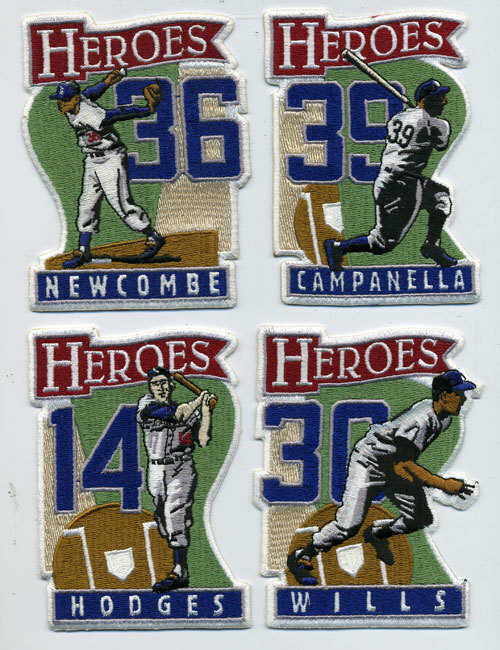 For the 1998 season each Dodger player selected a great Dodger player from the past, and we made sleeve patches to be worn on their uniforms. There were about 30 different ones. The Dodgers had this Marketing Trailer that they dragged around to schools and community events that was full of memoralbia and information on the history of the team. I designed this mural to decorate the sides of the trailer. 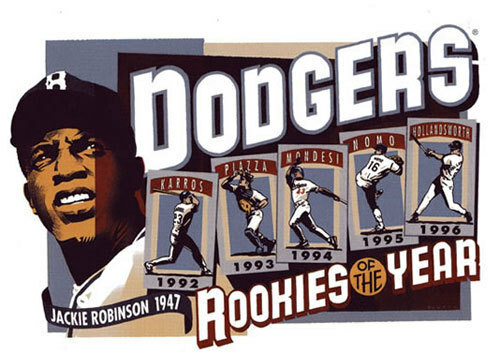 To commemorate the 50th anniversary of Jackie Robinson's breaking of the color barrier, the Dodgers produced this poster, It also pays tribute to the fact that a Dodger player had won the Rookie of the Year Award for the past five straight years. 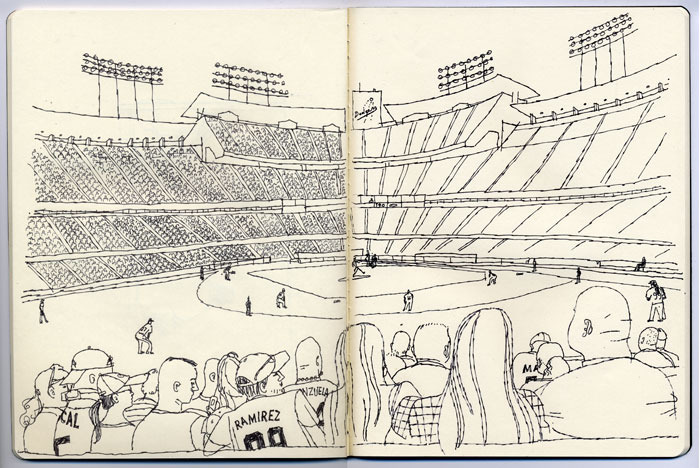 Sadly, this level of design only lasted at Dodger Stadium for as long as Dan was there. He very selfishly decided to move to Louisville KY for the benefit of his family. He actually put the lives of his children before thoughts of my illustration career and my access to great tickets.